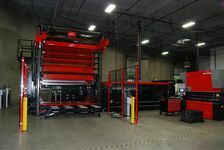 We offer the latest in Laser cutting technology. Our Amada FO MII 3015 NT with automatic load and un-load automation allows for unattended operation to help keep your Laser cutting cost low. Please give us a call, we would be happy to satisfy your laser cutting needs.